July 29, 2011 (San Diego’s East County) – Cal Fire warns of a high risk of flash floods and debris flow in areas burned by the Eagle Fire tonight through Sunday. Rob Balfour, National Weather Service Incident Meteorologist assigned to the Eagle Fire, forecasts a 40 percent chance of showers and thunderstorms over the burned area. An estimated 0.15 to 0.68 inches of rain could occur all at once, or in several episodes. Intense rainfall is most likely late Saturday afternoon/evening and again on Sunday. Rainfall rates as low as 0.15 inches in a 20 minute period are capable of producing debris flows and flash floods in recently burned drainage basins, which include popular camping areas in Anza-Borrego. July 27, 2011 (San Diego’s East County) – Cal Fire investigators have determined that arson is the cause of the Eagle Fire, which has thus far burned 14,100 acres and injured 14 firefighters. Who set the blaze, and what was the motive? Cal-Fire has not disclosed details on how the fire was started, or if there are any suspects. If caught, the perpetrator could face not only jail time, but a hefty bill--since firefighting costs now exceed $11.6 million. Update 7 p.m.: The Eagle Fire is 12,700 acres and 45% contained. There have been 6 minor injuries to firefighters. 11 miles of containment line to be built, and firefighters continue to construct, hold and improve containment lines. Cost to fight the fire $6.2 million. J uly 24, 2011 (San Diego’s East County)—Cal-Fire is now battling the 11,000 acre Eagle Fire in a unified command with the Bureau of Indian affairs and the California Department of Parks and Recreation. 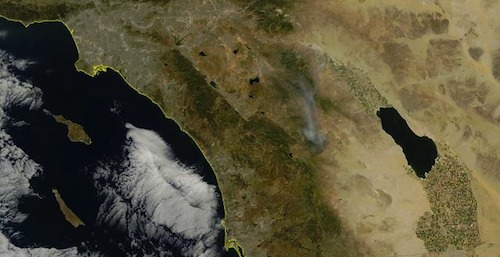 July 23, 2011 (San Diego’s East County) – The Eagle Fire, which began around 10:30 p.m. on Thursday, has scorched 4,000 acres and is 30% contained. The cost to suppress the fire is $2 million thus far, with 814 firefighters currently on the scene. The fire began near Highway 79 in the vicinity of the Los Coyotes Indian reservation near Warner Springs. Cal-Fire’s Roxanne Provaznik said there have been no reported injuries or structures threatened. However Ramona Patch.com and other media have reported outbuildings burned as well as property leased by a camp used for military training. Update 4:50 p.m. - The Eagle Fire is now 2,500 acres and 5% contained. The fire is expected to continue in a easterly direction away from populated areas. The current temperature is 83 degrees, with 27% humidity; winds are 13 mph from the west. The fire is burning on Bureau of Indian Affairs and State Park lands. Estimated cost to suppress the fire is $250,000 to date. Currently the are 15 Engines, 25 Fire Crews, 9 Water Tenders, 7 Airtankers, 9 Helicopters, 26 Overhead (567 Firefighters).